For many years (1981-3, 2001-14) I have developed a critical presentation of neoclassical (or mainstream) economics for my graduate students. I had intended to convert my lecture notes into a book, but health problem got in the way. So I am unable to complete the task. Therefore, I am making my notes/drafts of chapters available to anyone to either complete the task or at least use the notes for their own teaching and research. I have written an article about the course which can be found at this link. The problem sets, mathematical notes, and assessment (tests) can be found linked on the course outline on my homepage (http://heterodoxnews.com/leefs) under courses-Economics 5502: http://heterodoxnews.com/leefs/courses/econ-5502/. The lecture notes/chapters have changed over time, but the core has remained the same (see below). You will find that some Parts are relatively complete and others are not; also some parts are better developed and others are not. This is why I have not published the lectures—much work needs to be done. The lectures are calculus based in part because higher level mathematics provide no additional understanding of the theory and because the mathematics background of my students was only calculus. Moreover, the lectures are both historically oriented (that is trying to provide an historical understanding of the development of neoclassical microeconomics since 1900); and critical in that neoclassical microeconomics is shown not to be a theoretically sound body of arguments—but precisely the opposite (I and Steve Keen published an article summarizing many of the criticisms—see the link). Finally, the lectures try to provide an overall view of what neoclassical microeconomics is theoretically about. That is, neoclassical microeconomics deals with the economy as a whole in a disaggregate fashion and tries to explain how the economy works through the price mechanism. 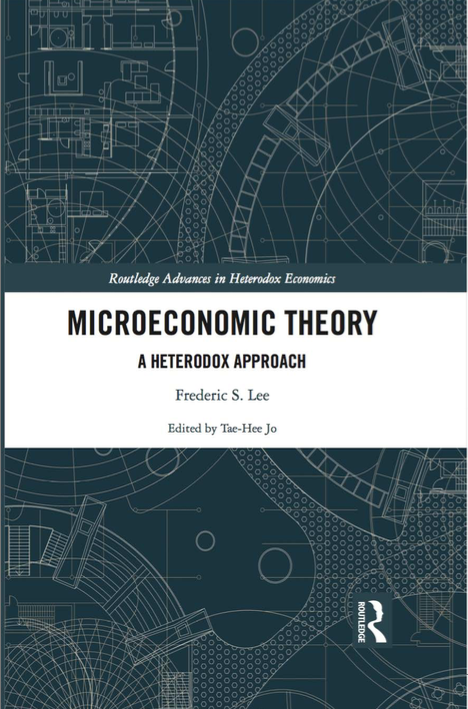 Whether one agrees with the theory or not is beside the point; neoclassical microeconomics attempts to provide a coherent theory of how the economy as a whole works. This is why any attacks on the theoretical coherence and empirical support of neoclassical microeconomics is vigorously attacked: such as the administered price/administered wage controversy, the cost controversy, and the marginalist/full-cost/normal cost pricing controversy (and of course there are others such as the capital controversy). These controversies directly attacked the theoretical coherence of the price mechanism though the use of empirical evidence. These controversies represent the most significant attack on neoclassical microeconomics (hence neoclassical economics as a whole); and the controversies are not yet over. The lecture notes deal with these controversies in the ultimate chapter which is not yet written and this is to be brought together to deliver a final pronouncement of neoclassical microeconomics. Somebody will now have to write that chapter.